A Child Care Agreement is used to establish an agreement between the guardians of a child (e.g. the parents) and a child care worker (e.g. babysitter or nanny) as to the terms of the employment. For example, it lists the compensation of the child care worker, whether they are allowed to bring friends into the home, whether the guardians will provide food or beverages, and other issues. Here, Address should be the address at which the child care will take place. How much are you paying per hour (e.g. $7.00)? Will this amount per hour will be multipled by the number of children? Will there be a minimum number of hours? Do you want to restrict visitors into your house? Will you be providing beverages to the Babysitter? Will you be providing food to the Babysitter? We strongly recommend obtaining an attorney reviewed Child Care Agreement directly from us. Below are some random samples we have created with Documatica. Please note that these documents reflect a certain set of answers, and it is very likely that the document you require is different. 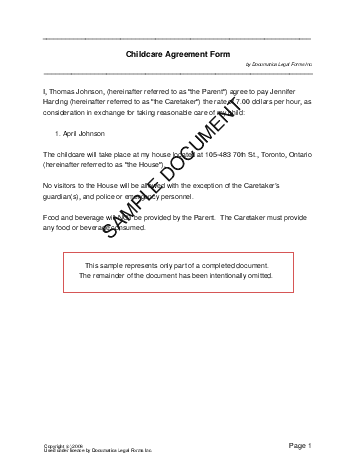 Do not rely on the templates below - create your own customized Child Care Agreement with our webpage. For maximum legal protection, obtain a lawyer reviewed Child Care Agreement directly from us.